Following the ominous losses of dual premiership combination Gary Ablett and Mark Thompson, the aging Geelong list had been earmarked for a decline from a four-year period of being the competition’s benchmark. The premiership window was closing and the emergence of Collingwood shot bullet holes in the near flawless Geelong game-plan which netted three grand final appearances and two flags. Enter Chris Scott. Barring Josh Hunt, those names are the first picked each week and have played alongside each other for their entire AFL careers to form the crux of Geelong’s team. 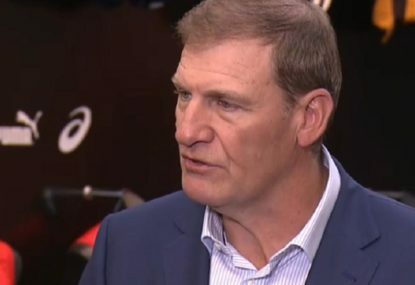 With the draft system operating in a way that teams will cycle from top to bottom before returning to the top, premiership windows are usually only open for three years when the core of talent are all in the peaks of their careers. So by logic, the declining class of 1999-2001 should mean Chris Scott is doomed to spend some time rebuilding in the near future. Over the next two years, Geelong is likely to lose Darren Milburn, Cameron Mooney, Matthew Scarlett, Brad Ottens, David Wojcinski, Paul Chapman and Cameron Ling with Joel Corey and Corey Enright not far behind. 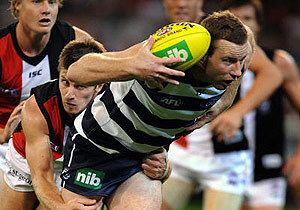 By keeping the best team on the field each week during the premiership runs, Joel Selwood and Harry Taylor were the only draftees from 2007 onwards to hold a regular spots in the Geelong line-up. An impenetrable team prompted the departures of Brent Molony (2004), Henry Playfair (2007), Tim Callan (2007), Brent Prismall (2008), Shane Mumford (2009) Broadie Moles (2009), Jeremy Laidler (2010), Ryan Gamble (2010) and Nathan Djukerra (2010) to find new clubs where they would be given greater opportunities. Given the absence of these players, Joel Selwood appears to be the only link between the old and new class of players. Despite finishing second in the 2010 AFL season, Geelong’s VFL affiliate side finished 10th indicating a large discrepancy between players 16-22 and 22-30. This is a significant difference to the 2007 season when Geelong won the premierships in both competitions. Given the task to keep Geelong’s premiership window open while blooding youth and getting games into youngsters, Scott faces a delicate balancing act by playing a team which may win a flag as the window closes or play a team which will avoid a bottom four finish in the coming years. The answer should be a no-brainer. 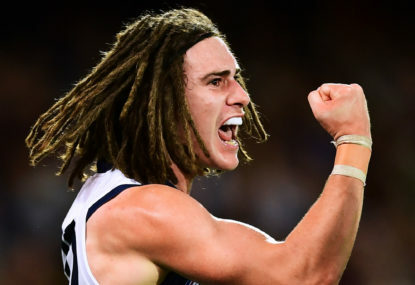 Watching Cameron Guthrie, Taylor Hunt and Daniel Menzel on Friday night showed that Geelong’s kids are still not ready for AFL football based on their decision making. Mitch Duncan was the exception. In the absence of Cameron Ling, Paul Chapman, Shannon Byrnes and James Podsiadly, none of their performances suggest they are capable of playing 15-plus games this year. Gifted with what other new coaches can only be envious of, Scott has a list capable of winning the flag this year. Giving Travis Varcoe and Mitch Duncan only brief stints in the centre bounces; Scott has made his intentions clear that an extensive rebuilding phase is out of the question. The arrival of Scott has also reinvigorated the games of David Wojcinski and Tom Lonergan who were both impressive in new roles. One man Chris Scott can seek advice from is Neil Craig who left the decision of whether to play on up to veterans Andrew McLeod, Tyson Edwards, Simon Goodwin and Brett Burton. If Scott holds onto his superstars for too long, like Craig, he will have a good team. But good teams don’t win premierships; great teams do. Scott must gamble with his future and continue to push for the flag this year rather than prepare for the decline. 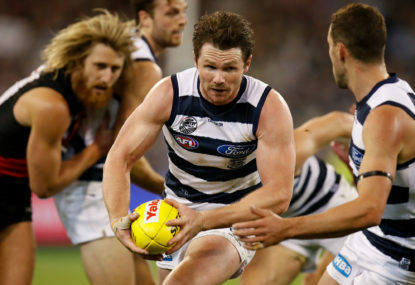 With a list still hovering around greatness, Scott must coach out the 2011 season with his experienced players in their premiership-winning positions if Geelong is to genuinely challenge for the flag. 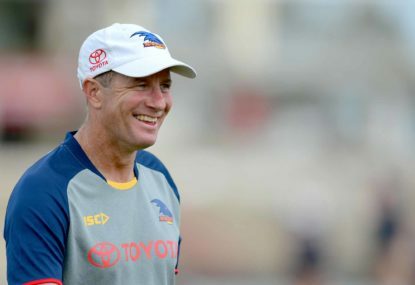 Come the end of the 2011 and 2012 seasons, Chris Scott will be the most unenviable man in the league when he must assess the superstar class of 1999-2001 against the future of the club. He must not play kids merely to get games into them. Match Review Officer Michael Christian discusses his decisions following Round 4. Why were we so desperate to write off the Cats? In the early rounds of the season, a lot of us tip the outcome of games based on what our preseason expectations were of the clubs involved. 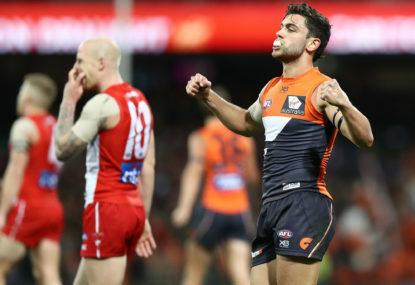 Nothing that has happened in the AFL in the first two weeks of the season makes sense. Nothing, except, the team that sits atop the ladder. Despite Geelong’s attacking revamp, Adelaide coach Don Pyke expects one thing to remain the same in Thursday night’s AFL game.